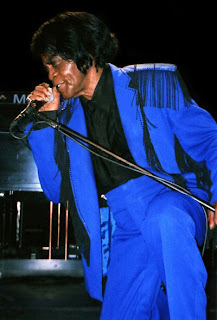 Just a brief update to let you know that my exclusive interview with James Brown's widow, Tomi Rae Brown, was published today on the fourth anniversary of her husband's death. In October, Tomi Rae granted me the most in-depth interview she has ever given to any reporter. During our 75 minute chat we discussed her marriage the Godfather of Soul and the nightmarish four years she's spent battling a smear campaign orchestrated by some of her late husband's associates. In a teaser published earlier this week, Tomi Rae slammed claims that James Brown had used controversial doctor Conrad Murray and then recommended him to Michael Jackson. The full interview, published today, includes the shocking revelation that trustees ordered James Brown's legs to be cut off in order to obtain DNA for a paternity test. Click here to read my exclusive interview with Tomi Rae Brown. Christmas Day always brings back memories of James Brown for me. 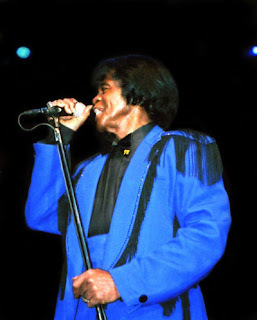 As an 18 year old journalism student, my first celebrity encounter was James Brown. Having been on my journalism course for just a matter of weeks, in October 2006 I managed to talk my way into a press conference with my hero, the Godfather of Soul. Mr Brown not only took a question from me, but also put me on his personal guest list for the show. They say journalism can afford you the opportunity to meet your heroes - I met mine in training and it was an experience I'll never forget. Less than two months later, I walked downstairs on Christmas Day and almost immediately saw Mr Brown's picture on television. Beneath it flashed the dates, '1933-2006'. I stood frozen for a moment before blurting out, 'James Brown has died.' I was in total shock; just weeks previously I'd watched him perform a two hour concert in London. A dark cloud hung over that Christmas. Nowadays, Christmas has become a time to celebrate James Brown. Although there'll always be a hint of sadness at losing my hero on Christmas Day, it's an ideal time to put his CDs in the stereo or his DVDs in the player and bask in his incredible talent. With that in mind, here are three pictures I took from my front row spot at James Brown's gig at The Forum, London, on 26th June 2005. 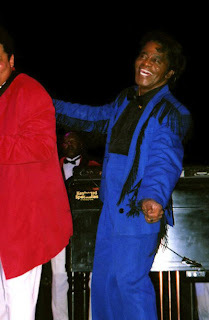 Of the four James Brown gigs I attended before he passed away, this was easily the best. In fact, it was probably the greatest concert I've ever been to. Having recently staved off prostate cancer, Brown had lost a lot of surplus weight and seemed to be in very high spirits. His energy was unbelievable. This is how I like to remember James Brown at this time of year. Have a soulful Christmas!